The Echo Park based singer-songwriter’s new album, Fanfare, draws on the ’70s with contributions from rock ‘n roll heavyweights like David Crosby and Jackson Browne. 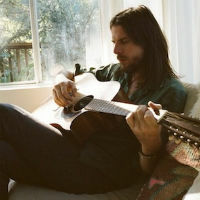 Born and raised in North Carolina, Jonathan Wilson made his way to Los Angeles when he was nineteen, hoping to make it big with his bandmates from back home. That didn’t happen but Wilson stuck around and became a musician’s musician, making nouveau folk-rock reminiscent of the Woodstock generation. He’s been popular overseas for years but in L.A. he is first and foremost known for revitalizing the Laurel Canyon music scene, the neighborhood that was home to Joni Mitchell, Frank Zappa, and Jim Morrison, among others, during its musical heyday in the late 60s and 70s. While he lived there from 2005 to 2010, Wilson organized backyard jam sessions where Elvis Costello and Graham Nash were among the visitors. ❶ With the release of his third solo album, Fanfare, on October 15, Wilson is aiming to broaden his audience. The record, which fuses elaborate orchestrations with singer-songwriter intimacy, also boasts musical contributions from folk rock legends David Crosby, Graham Nash, and Jackson Browne. ❹ David Crosby, Graham Nash, The Wallflowers, Elvis Costello, Barry Goldberg, Patrick Sansone of Wilco, The Black Crowes, and Benmont Tench of Tom Petty and the Heartbreakers all performed in Wilson’s old backyard.